A 1,019Kva 40ft trailer unit ready to go! Manton Wood place an order for a Cummins KTA38G5 in a 40ft ISO container. Sound attenuated to 85dBA@1m and mounted on a trailer. Also includes circuit breaker and a 5,000 litre bulk fuel storage tank. 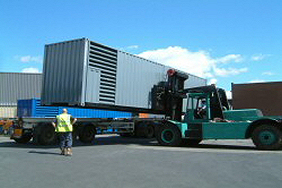 MEMS place orders for a single 30ft container with a 1040Kva Cummins set and three 20ft containers with 700kva Rolls Royce engines inside. 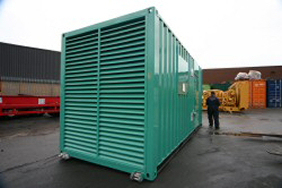 Another two generators are also due to be delivered to MEMS later this year. 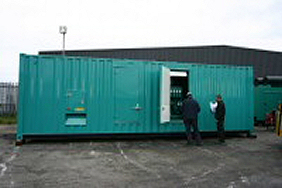 Cummins free issued a 1041kVA generator to build into one of our 30ft containers, sound attenuated to 65dBA@1m with a 12 hour base tank. The set was load tested at our works with Cummins looking on, the load was on for a number of hours and the set worked perfectly. Another happy customer! 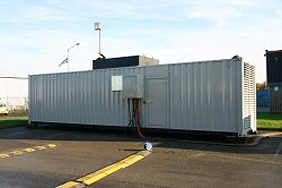 Morrisons order 2 1500kVA units housed in a 40ft container, sound attenuated to 85dBA at 1m for their new HQ in Bradford. 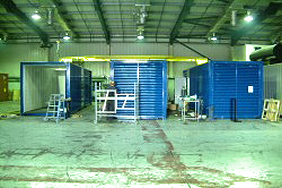 These gen-sets are now due for commissioning at the start of 2005. These 2 standard Cummins canopied gen-sets are now powering seperate telecoms towers in the UK. These UK built generators were sold unmodified, except for a new ADE sticker. 450kVA Super Silenced generators with fuel tanks and separate switch room. 'It was very handy being able to work on two almost identical generators at the sametime, especially with the required noise levels being 60dB(A) at one metre. I really enjoyed making these enclosures.' Ian Kirby, Workshop Manager. The picture shows engine room of this generator. Complete with transformer, large capacity fuel tanks, switched distribution and fire protection system. We are still taking orders for these huge projects and look forward to delivering many more throughout 2005.nother pat on the back for our fabrication team for overcoming many obstacles and manufacturing another excellent package.